I once spent a messy, dawn moment on the slopes of Dingle with Steve Cooney. The Australian guitarist had been initiated into the ways of Aboriginal mysteries and he explained some of the benefits between puffs on a roll-up. He said that he was able to experience the spirit and the energy force in the mountains and the rivers and other parts of the landscape. In the Australian Outback, he explained, it felt massive. In Ireland, he said, it was a bit less intense but it was there, absolutely, pulsatingly true. 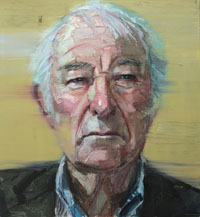 Seamus Heaney was no Aboriginal but he was sensitive to the unspoken magic of Bellaghy and Mossbawn – to the birch trees and the flax dam, in the petrified wood, cow dung, reed music, Moyola River and the vestigial call of the place names. We admired him and believed him. He took home his Nobel Prize and he sustained a communion between the magus and the townland until we lost him in September 2013. That’s three years of grieving and coming to terms with a poet of the greatest order. Presently, the Heaney HomePlace will honour the writer and his sense of belonging with a physical building and a central performance area, The Helicon. This will doubtless be special. However there is the inconvenience of another civic decision – to route the A6 roadworks into the heart of Heaney country. The main political parties are quiet on a move that lacks the mandatory environmental reports. It’s an unlawful call, but hey, that didn’t stop the fracking operations at Woodburn Forest and it seems likely that the bulldozers will disturb this area soon. Hence this urgent call to the Lyric Theatre, Belfast. Poets, actors and musicians, strategies for resistance and the eloquent voice of James Orr from Friends Of The Earth, who talks about this last great expanse of lowland wet grassland. It is home to the wild swans of Ireland. Does the planning amount to desecration? Sure it does. Can you do anything about it? James points out that nobody is going to do this protesting for you. It demands a quick response. The input of creative people at the Woodburn site was hugely beneficial, he reckons. This time, it will also need lawyers, crowdfunding and proper commitment. A previous meeting at the Féile an Phobail was attended by four people, including the organiser. But support is quickening, and tonight’s event is full. A chance to hear Ciaran Carson playing ‘The Blackbird’ and to realise that a moment has arrived. The intent of Leontia Flynn, reading from North and Neil Martin with ‘Minstrel Boy’, losing us in the feeling. Gerard Dawe visits to the prose of Preoccupations and Heaney’s own measure of location. Altogether, it’s a matrix of belonging, an immense rebuke to the planners. Sinead Morrissey returns to Death Of A Naturalist, the bedrock poem that has maybe been lost to us by over-officious school studies. Tonight it clutches on the imagination again. How can so little respect be afforded to this location when an absurd deal of energy has been afforded to, say, Game Of Thrones and those facile connections? Do we need an American TV production to alert us to wonderful trees and locations? Is our cultural cringe still that bad? Michael Longley has chosen The Harvest Bow, a reminder of fatherhood, love and the Autumnal call of long grass and midges. Michael is a tangible connection to Seamus, a considerate, sonorous brother. The occasion wells you up. Likewise when Stephen Rea enacts Heaney’s translation of The Aeneid Book VI, his posthumous work. The actor walks us into The Underworld, where Aeneas has struggled to meet his dead father Anchises. The meeting is overwhelming but physical contact is denied to them both. So close. Heartbreak. Outside in the bar area, Barry Douglas plays O’Carolan’s ‘Farewell To Music’, followed by something Hungarian and dramatic and then ‘My Lagan Love’. People exchange contacts and state resolve. There has been a reprieve, after all at Standing Rock, Dakota, when the Sioux defended their habitat from oil pollution and the President took some heed. Closer to home and there is this exceptional, common ground. No diggity. You dig?